Auerbach attempted to make a living from performing at small bars in town, but realized he would not be able to book shows in other cities without a demo. To record one, he asked for help from Carney, who agreed to provide recording equipment and allow his basement to be used if Auerbach recruited the other musicians. However, none of Auerbach's backing band showed up on the recording date. Instead, Carney and Auerbach jammed, eventually leading to the duo forming a band in mid-2001. Together, they recorded a six-song demo consisting of "old blues rip-offs and words made up on the spot" with minimal equipment. After sending the demo to a dozen record labels, they received and accepted an offer in 2002 from a small indie label in Los Angeles called Alive, as it was "the only label that would sign [them] without having to see [them] first". According to an interview on NPR's Fresh Air, the group's name "the Black Keys" came from an artist diagnosed with schizophrenia, Alfred McMoore, that the pair knew; he would leave incoherent messages on their answering machines referring to their fathers as "black keys" such as "D flat" when he was upset with them. On March 20, 2002, the duo played their first live show at Cleveland's Beachland Ballroom and Tavern to an audience of approximately eight people. The band's debut album, The Big Come Up, was recorded entirely in Carney's basement on an 8-track tape recorder in lo-fi and was released in May 2002, three months after they signed to Alive. The album, a mix of eight original tracks and five cover songs, forged a raw blues rock sound for the group; the covers included tracks originally by blues musicians Muddy Waters, Junior Kimbrough, and R. L. Burnside. Two tracks, covers of the traditional blues standard "Leavin' Trunk" and The Beatles' song "She Said, She Said", were released as a single on Isota Records. The track "I'll Be Your Man" would later be used as the theme song for the HBO series Hung. In order to help fund a tour, Auerbach and Carney took jobs mowing lawns for a landlord. Despite modest sales for The Big Come Up, it gained a cult following and attracted attention from critics, eventually landing the group a record deal with Fat Possum Records. The Black Keys released an EP titled The Moan on January 19, 2004, featuring "Have Love Will Travel", an alternate version of "Heavy Soul", and two covers. The group found itself struggling to sell records or gain airplay of their songs on the radio, and they were not making much money either; they had to absorb a $3,000 loss from a European tour. Frustrated with their lack of success, the band relented and decided to begin licensing their music, beginning with the song "Set You Free" in a Nissan automobile commercial. It was the first of an eventual 300-plus song placements in television shows, films, TV commercials, and video games. The group played several high-profile musical festivals in the first half of 2004, including Coachella and Bonnaroo. For their eighth studio album, Turn Blue, the band once again collaborated with Danger Mouse, who co-produced and co-wrote the album. It was recorded primarily at Sunset Sound in Hollywood, California, from July–August 2013, with additional recording at Key Club in Benton Harbor, Michigan, and Nashville's Easy Eye Sound in early 2014. The album was announced in March 2014 via Mike Tyson's Twitter account, with a link to a cryptic teaser video on YouTube featuring a hypnotist, and was released on May 13, 2014. The record exhibits psychedelic rock and soul influences and features a more melancholy tone, largely in part due to Auerbach dealing with the divorce from his wife during the album sessions. The first single, "Fever" was released on March 24, while a second single, "Turn Blue", followed on April 14. The album debuted at number one in the US and Australia, the band's first record to top the album charts in either country; 164,000 copies were sold in the US in its first week. The group embarked on a world tour in May 2014 to support the album, with Cage the Elephant, Jake Bugg, and St. Vincent all separately opening for them. 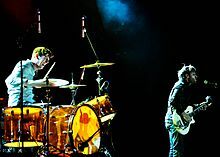 In 2015, Turn Blue was nominated for the Grammy Award for Best Rock Album, with "Fever" being nominated for the Grammy Award for Best Rock Song as well as the Grammy Award for Best Rock Performance. The band entered a hiatus after the release. During the band's hiatus, Auerbach and Carney were involved in several musical projects on their own. Auerbach formed the Arcs in 2015, who released their debut album, Yours, Dreamily, that September. He also released his second solo album, Waiting on a Song, in 2017, and contributed to albums by artists such as The Pretenders, A$AP Rocky and Jake Bugg. Meanwhile, Carney worked as a producer on albums by Tobias Jesso, Jr. and Karen Elson, and he composed the theme song to the Netflix animated series BoJack Horseman with his late uncle Ralph Carney. In 2017, Carney served as a co-writer, producer, and drummer on Hopeless Romantic, the first studio album by Michelle Branch in 14 years. After beginning a relationship while working on the album, the two were engaged in July 2017. On March 7, 2019, the Black Keys released the single "Lo/Hi", their first music together in nearly five years. A week later, the band announced a North American tour co-headlining with Modest Mouse. Note: At the 53rd Annual Grammy Awards (2011), Michael Carney was nominated and won the award for Best Recording Package, for Brothers. At the 55th Annual Grammy Awards (2013), Dan Auerbach was nominated and won the award for Producer of the Year, Non-Classical, for work including the band's El Camino. ^ Hunter, James (September 8, 2004). "The Black Keys: Hardly Retreads; On 'Rubber Factory,' the Indie Rockers Get High Mileage Out of Steel-Belted Blues". The Washington Post. ^ a b Leahey, Andrew (November 1, 2011). "The Black Keys: Brothers In Arms". American Songwriter. Retrieved December 8, 2011. ^ a b c d e Hiatt, Brian (January 19, 2012). "Black Keys Rising". Rolling Stone (1148): 38–41, 66. Retrieved February 17, 2012. ^ a b c "The Fresh Air Interview: The Black Keys". NPR Music. NPR. January 31, 2011. Retrieved February 2, 2012. ^ a b Leslie, Jimmy (November 1, 2003). "Fuzz freak: the Black Keys' Dan Auerbach on the majesty of muck". Guitar Player. ^ Joy, Kevin (March 6, 2012). "Retro-rock duo from Akron now playing to arena crowds". The Columbus Dispatch. The Dispatch Printing Company. Retrieved March 13, 2012. ^ a b c d e Leahey, Andrew (November 1, 2011). "The Black Keys: Brothers In Arms". American Songwriter. Retrieved December 8, 2011. ^ a b c Lynskey, Dorian (September 2010). "Blues Explosion!". Spin. 26 (8): 60–63. Retrieved August 30, 2012. ^ a b c Uhelszki, Jaan (August 29, 2014). "The Black Keys: Chart-Topping Blues". Relix. Relix Media Group. Retrieved September 3, 2014. ^ a b Katz, Larry (October 7, 2003). "Into the Black; Keys unlock a raw, bluesy sound". Boston Herald. Herald Media Inc. sec. The Edge, p. 47. ^ a b Gross, Terry (presenter) (January 31, 2011). "The Fresh Air Interview: The Black Keys". Fresh Air. Philadelphia. NPR. WHYY-FM. ^ "Akron artist Alfred McMoore dies; cried for people he never met". Ohio.com. Akron Beacon Journal. September 28, 2009. Retrieved April 22, 2012. ^ Mapes, Jillian (December 6, 2011). "The Black Keys' 'El Camino': Track-by-Track Review". Billboard.com. Prometheus Global Media. Retrieved February 19, 2013. ^ Inskeep, Steve (presenter) (November 24, 2006). "Keeping it Primitive with The Black Keys". Morning Edition. NPR. Archived from the original on September 21, 2013. ^ a b Graff, Gary (March 11, 2012). "The Black Keys hitting all the right notes". Reading Eagle. Reading Eagle Company. Retrieved March 13, 2012. ^ Greenblatt, Leah (March 19, 2003). "SXSW 2003". SeattleWeekly.com. Village Voice Media. Retrieved August 23, 2012. ^ Abram, Malcolm X (March 14, 2012). "March 13, 2003: Black Keys head for South By Southwest, success in their sights". Ohio.com. Akron Beacon Journal. Retrieved August 23, 2012. ^ Tyrangiel, Josh (December 18, 2003). "Top 10 Everything 2003: Music – 3. Thickfreakness by The Black Keys". Time.com. Time Inc. Retrieved June 8, 2012. ^ a b Simpson, Dave (December 1, 2011). "'We've put in more hours than anyone': The Black Keys interviewed". guardian.co.uk. Guardian Media Group. Retrieved February 6, 2012. ^ a b Mason, Anthony (reporter) (April 22, 2012). "The Black Keys: No longer the underdogs". CBS News Sunday Morning. Season 33. CBS. Retrieved April 22, 2012. ^ a b c Dansby, Andrew (June 24, 2004). "Black Keys Open 'Factory'". Rolling Stone. Retrieved March 11, 2012. 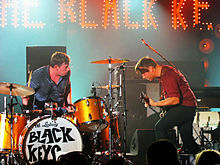 ^ a b "Black Keys Unlock World Tour, New Single". Billboard.com. Prometheus Global Media. Retrieved February 13, 2013. ^ "Episode dated 8 August 2003 (8 Aug. 2003)". IMDb. Retrieved February 13, 2013. ^ Ratliff, Ben (July 8, 2004). "ROCK REVIEW; A Blues Duo Seeking Virtue In Plainness". The New York Times. Retrieved March 11, 2012. ^ Vozick-Levinson, Simon (April 20, 2012). "Black Keys on Their First Coachella as Headliners". Rolling Stone. Retrieved May 1, 2013. ^ Kielty, Tom (June 12, 2004). "Bonnaroo fest off to a scorching start". The Boston Globe. Retrieved January 22, 2013. ^ "The Black Keys – Awards". Allmusic. Retrieved January 22, 2013. ^ Proskocil, Niz (November 30, 2006). "Black Keys retain bare-bones blues and rock combo". Omaha World-Herald. ^ "Black Keys Rock The Elderly In New Video". Billboard.com. Prometheus Global Media. October 5, 2004. Retrieved March 17, 2013. ^ "Black Keys Rock The Elderly In New Video". Billboard.com. Prometheus Global Media. Retrieved February 13, 2013. ^ DeRogatis, Jim (July 25, 2005). "basic PROGRAMMING // It's not an alt-rock fest anymore, but it's fan-friendly and sounds good". Chicago Sun-Times. p. 42. ^ a b Anderman, Joan (October 31, 2006). "Black Keys retexture the blues". The Boston Globe. ^ Ethridge, Mary (August 2, 2006). "Lingerie ad uses smooth touch of Akron: Black Keys song featured in Heidi Klum TV spot". Akron Beacon Journal. ^ Anderman, Joan (September 10, 2006). "Impressions: Pop Recordings". The Boston Globe. Retrieved June 8, 2012. ^ Abram, Malcom X (September 17, 2006). "The Keys to success". Akron Beacon Journal. ^ "In the Studio: The Black Keys". Rolling Stone. February 25, 2008. Retrieved March 11, 2012. ^ Thornton, Stuart (April 17, 2008). "Attack & Release". Monterey County Weekly. ^ Williams, Rob (April 19, 2008). "The Black Keys / Attack & Release (Nonesuch/Warner)". Winnipeg Free Press. ^ Gottlieb, Jed (May 15, 2008). "Entering the Danger Mouse zone". The Boston Herald. Retrieved June 8, 2012. ^ "The 100 Best Singles of 2008". Rolling Stone. December 25, 2008. Archived from the original on December 29, 2008. Retrieved February 21, 2013. ^ Abram, Malcolm X (October 17, 2008). "Devo's benefit concert whips up vote". Ohio.com. Retrieved January 22, 2013. ^ "The Black Keys: Live at the Crystal Ballroom (DVD)". Nonesuch Records. Retrieved January 22, 2013. ^ Miller, Eric T. (October 26, 2009). "Q&A With The Black Keys' Patrick Carney". Magnet. Retrieved March 24, 2012. ^ Valania, Jonathan (June 8, 2009). "The Roots Steal the Show From Black Keys, Public Enemy at Picnic". Rolling Stone. Retrieved January 22, 2012. ^ "Independent Music Awards – 9th Annual Judges". IndependentMusicAwards.com. Archived from the original on October 1, 2011. Retrieved December 12, 2010. ^ "She & Him, The Black Keys, Mark Hoppus, Aimee Mann, And Bettye LaVette Join Judging Panel For The 9th Annual Independent Music Awards". Top40-Charts.com. May 27, 2009. Retrieved January 22, 2013. ^ Prince, David J. (September 14, 2009). "Black Keys Reveal Blakroc Hip-Hop Project Details". Billboard.com. Prometheus Global Media. Retrieved February 19, 2013. 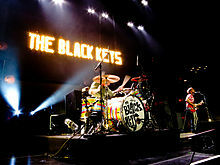 ^ "Black Keys Find New Home in Nashville". Billboard. Associated Press. December 13, 2010. Retrieved June 16, 2014. ^ Monday (February 22, 2010). "Shorts: Punch Brothers, Black Keys, Runaways Movie, Trash Can Sinatras, Doves 'Best', Stone's 'Exile', Grace Potter – Music News / New Music – Direct Current". Directcurrentmusic.com. Archived from the original on July 11, 2012. Retrieved December 12, 2010. ^ "''The Black Keys Fan Lounge'' online". Theblackkeysfanlounge.com. May 18, 2010. Retrieved December 12, 2010. ^ "''The Black Keys Fan Lounge'' online". Theblackkeysfanlounge.com. April 1, 2010. Retrieved December 12, 2010. ^ a b "The Black Keys – Chart history: Hot 100". Billboard.com. Prometheus Global Media. Retrieved February 19, 2013. ^ a b c d e f "Record Certifications Around the World". TheBlackKeys.com. October 26, 2012. Archived from the original on November 15, 2012. Retrieved November 26, 2012. ^ "The Black Keys - Tighten Up (Official Music Video)". May 20, 2010. Retrieved January 10, 2012. ^ "VMA Playlist: All-Time Best Breakthrough Videos". 2010. Retrieved January 10, 2012. ^ "The Black Keys' "Brothers" Debuts at No. 3 on Billboard Album Chart with Band's Best One-Week Sales Ever". Nonesuch Records. May 26, 2010. Retrieved February 6, 2011. ^ a b c d e Kara, Scott (December 1, 2011). "The Black Keys get back into the groove". The New Zealand Herald. Retrieved December 8, 2011. ^ a b c d Light, Alan (December 4, 2011). "First, Hit It Big. Then Change". The New York Times. p. AR1. Retrieved December 7, 2011. ^ "9th Annual IMA Artist Judges". Independent Music Awards. Retrieved July 26, 2011. ^ Mapes, Jillian (January 6, 2012). "Tightened Up: Inside the Black Keys' Rise to Arena-Sized Fame". Billboard.com. Prometheus Global Media. Retrieved February 19, 2013. ^ Petrusich, Amanda (December 14, 2010). "Artist of the Year: The Black Keys". Spin. Retrieved February 2, 2012. ^ Hogan, Marc (December 5, 2011). "Watch the Black Keys' Triumphant Return to 'SNL'". Spin.com. Spin Media LLC. Retrieved December 5, 2011. ^ Kennedy, Gerrick D. (February 13, 2011). "Grammy Awards: Black Keys, on being one of the evening's wild card winners". LATimes.com. Tribune Company. Retrieved February 2, 2012. ^ "Past Winners Search – Artist: Carney". GRAMMY.com. The Recording Academy. Retrieved February 6, 2012. ^ "Black Keys cancel tour dates because they are 'drained'". NME. January 18, 2011. Retrieved February 2, 2012. ^ "Howlin' for You Behind-the-Scenes". Retrieved January 10, 2012. ^ "Howlin' for You". Warner Bros. Records. February 10, 2011. Archived from the original on July 11, 2012. Retrieved March 31, 2011. ^ "Howlin' for You: IMDB page". February 10, 2011. Retrieved January 10, 2012. ^ "MTV VMA Best Rock Video Nominees 2011". Retrieved January 10, 2012. ^ John Blistein, "Black Keys Donate 'Howlin' For You' To PETA Campaign", Rolling Stone, 4 February 2015. ^ "Full 2011 Billboard Music Awards Finalists List". Billboard.com. Prometheus Global Media. Retrieved February 20, 2013. ^ a b Kocsis, Julie (December 13, 2011). "The Black Keys' Potential to Be America's New Favorite Rock Band". The Huffington Post. Retrieved December 13, 2011. ^ Johnson, Kevin C. (April 26, 2012). "The Black Keys don't change much in move to arena shows". STLtoday.com. St. Louis Post-Dispatch. Retrieved April 27, 2012. ^ a b c Light, Alan (December 4, 2011). "First, Hit It Big. Then Change". The New York Times. p. AR1. Retrieved December 7, 2011. ^ Erlewine, Stephen Thomas. "El Camino – The Black Keys". Allmusic. Retrieved December 5, 2011. ^ "Discography The Black Keys". australian-charts.com. Hung Medien. Retrieved February 14, 2012. ^ "The Black Keys – Chart history: Billboard Canadian Hot 100". Billboard.com. Prometheus Global Media. Retrieved February 19, 2013. ^ Abram, Malcolm X (December 5, 2011). "'El Camino' should keep Black Keys on road to success". Akron Beacon Journal. Retrieved December 6, 2011. ^ "Critic Reviews for El Camino". Metacritic. CBS Interactive. Retrieved December 1, 2011. ^ Caulfield, Keith (December 14, 2011). "Michael Buble's 'Christmas' Stays Atop Billboard 200, Black Keys Hit No. 2". Billboard.com. Prometheus Global Media. Retrieved February 19, 2013. ^ Suddath, Claire (December 7, 2011). "The Top 10 Everything of 2011 - Black Keys, El Camino". Time. Retrieved December 13, 2011. ^ Kaye, Deirdre (March 5, 2012). "Review: The Black Keys/Arctic Monkeys at US Bank Arena". Cincinnati CityBeat. Retrieved March 11, 2012. ^ Stevenson, Jane (December 3, 2011). "The Black Keys announces new tour". lfpress.com. Sun Media. Retrieved January 15, 2012. ^ "The Black Keys Announce Second Leg of North American Tour". Nonesuch Records. January 9, 2012. Retrieved January 15, 2012. ^ Kane, Tyler (December 9, 2011). "The Black Keys Sell Out Madison Square Garden in 15 Minutes". Paste. Paste Media Group. Retrieved January 4, 2012. ^ Soeder, John (March 18, 2012). "The Black Keys are bigger than ever as they return to Northeast Ohio to play The Q". Cleveland.com. Cleveland Live LLC. Retrieved March 19, 2012. ^ "The Black Keys – Chart history: Alternative Songs". Billboard.com. Prometheus Global Media. Retrieved February 20, 2013. ^ Kosinski, TJ; Salisbury, Vanita (June 20, 2012). "Festival Face-Off". NYMag.com. New York Media, LLC. Retrieved May 1, 2013. ^ Almendrala, Anna (January 11, 2012). "Coachella 2012 Lineup Announced: The Black Keys, Radiohead, Dr. Dre & Snoop Dogg Headlining". The Huffington Post. ^ "Festival Lineup" (PDF). Memphis in May. ^ Lipshutz, Jason (April 11, 2012). "Lollapalooza 2012 Lineup: Black Sabbath, Chili Peppers, Black Keys Headlining". Billboard. ^ Collins, Leah (March 21, 2012). "Osheaga 2012 lineup: Black Keys, Snoop Dogg, Florence and the Machine added to bill". National Post. ^ Abram, Malcolm X (February 11, 2013). "Black Keys artists score four Grammys". Ohio.com. Akron Beacon Journal. Retrieved February 11, 2013. ^ Payne, Chris (March 21, 2014). "The Black Keys Announce New Album 'Turn Blue' Via Mike Tyson's Twitter". Billboard.com. Prometheus Global Media. Retrieved May 22, 2014. ^ Randall, Mac (May 12, 2014). "The Black Keys Defy Radio Trends on 'Turn Blue': Album Review". Billboard.com. Prometheus Global Media. Retrieved May 12, 2014. ^ Montgomery, James (March 21, 2014). "The Black Keys Announce New Album 'Turn Blue' Due Out May 13th". Radio.com. CBS Local Media. Retrieved March 21, 2014. ^ Minsker, Evan (April 14, 2014). "The Black Keys Share Their New Song "Turn Blue"". Pitchfork Media. Retrieved May 22, 2014. ^ a b Caulfield, Keith (March 21, 2014). "The Black Keys Earn First No. 1 Album, Michael Jackson Debuts At No. 2". Billboard.com. Prometheus Global Media. Retrieved March 22, 2014. ^ Staff writer (May 17, 2014). "The Black Keys Score First Australian #1; Michael Jackson Settles for #3". themusic.com.au. Street Press Australia. Retrieved May 21, 2014. ^ Moore, Sam (March 30, 2017). "The Black Keys' Dan Auerbach announces new solo album and shares new music video". NME. Retrieved March 3, 2019. ^ "Michelle Branch & New Boyfriend Patrick Carney Made an Excellent Pop-Rock Album: 'It Was Us Against The World'". Billboard. Retrieved March 27, 2017. ^ "Michelle Branch Gets Engaged to Patrick Carney". July 3, 2017. ^ Cook-Wilson, Winston. "NEWS \ The Black Keys Release "Lo/Hi," Their First New Single in Five Years". SPIN.com. Prometheus Media LLC. Retrieved March 7, 2019. ^ a b Coyle, Jake (June 22, 2010). "The Black Keys pride selves as 'unperfectionists'". Boston.com. The New York Times Company. Associated Press. Retrieved April 24, 2012. ^ Lowe, Zane (presenter) (April 30, 2014). The Black Keys in session (Radio broadcast). BBC Radio 1. Retrieved May 5, 2014. This page is based on the Wikipedia article The Black Keys; it is used under the Creative Commons Attribution-ShareAlike 3.0 Unported License (CC-BY-SA). You may redistribute it, verbatim or modified, providing that you comply with the terms of the CC-BY-SA.